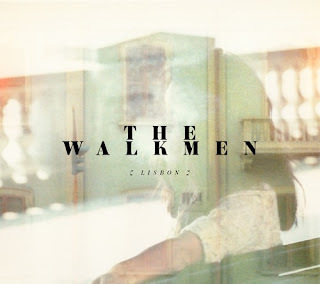 Rather than break down The Walkmen's newest, Lisbon, in the track-by-track format that has become so common in this space, I'd like to talk about the successful chameleon act The Walkmen have pulled off with this album. Lisbon is, for the most part, another collection of quietly artsy, galloping indie-rock tracks with Hamilton Leithauser's trademark crying vocals, but it's also a cohesive experience; a complete album. On Lisbon, the band takes up horns and turns up the melancholy, but they never sacrifice the enjoyability of the album. Nothing here has the bravado and punk-influence of previous work like Bows + Arrows, but those traits are traded for dreamy masterwork surf-rock that compares well to Beach House's Teen Dream. The theme seems to be escaping the city for a more peaceful life in the country, where space equates to freedom and loneliness equates to self-evaluation and slowing down. The Walkmen have evolved into a band of beautiful imagery and slow riffs for Lisbon, and that leads to some incredibly satisfying music. Still, The Walkmen drop back to the old styling at one point on the album with "Angela Surf City," a song so driving and fun that it's a remarkable lift as the second track on the disc. But aside from that exception the pacing is calm, the mood is one of lamentation and wailing vocals, and some of the songs begin to blend together. As the band attempts to be something more emotional, at least more emotional in the sadness sense, rather than the aggressive sense, they also give away some of the work that attracted their audience to begin with. It's the chance they take. But, with Lisbon, The Walkmen have a great album, one of dreamy satisfaction that perfectly captures the transitional season of autumn and the ways we all phase from creatures of high-energy to creatures of comfort and quiet. It's a bold move by a band that continues to buck roles and expectations to transform. And it's a perfect album for an overcast day and a cup of coffee.